Growthpoint Properties own and manage quality commercial properties within Australia. 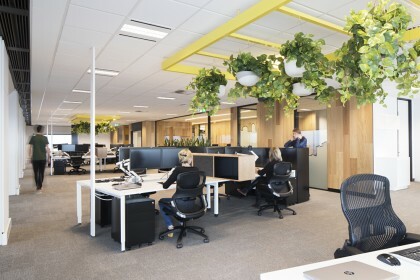 Linear were engaged to create an engaging workspace that showcased their core business in property and reflected Growthpoint as progressive, transparent, professional, diverse and fun. The philosophy behind the design concept was to reinforce a strong connection with property through a design language developed around the characteristics of the modern urban environment. In particular developing spaces inspired by buildings, plazas and sky gardens.Built zones took on the form and finishes of modern architecture, the breakout became a plaza – a place to gather – with trees, finishes and furniture with an outdoor feel. Amongst the workspace hangs the sky garden bringing greenery, views and a sense of rooftop balcony to the open plan work environment.The line between formal space and workspace is blurred through the very transparent wall at reception reinforcing openness and transparency and connecting reception staff to the broader team. A skyline graphic forms a strong decal and references the outstanding iconic Melbourne views seen from their workspace. Growthpoint have adopted a very open and collaborative working model allowing maximum long term flexibility and enabling greater collaboration between teams. Amongst the workspace are teaming pods, booths and furniture solutions – all wired up with technology – to provide places for teams to work and meet in a more informal environment.